Mustard Me Yellow: A tiny bump. We're having a boy! I had a feeling from the moment I found out I was pregnant that we would be having a boy. Daniel is so excited to have a little mountain biking, hiking, running, sports, and adventure buddy. Those two will be the best of friends, I just know it. This picture was taken at 20 weeks. I am currently 22.5 weeks and already feel so much bigger from just a few weeks ago. Baby boy is starting to kick like crazy and is growing every day. Now the challenge we'll be facing for the next while is...what will we name him??? I've got a whole name list coming your way. Love it! You are such a cute pregnant lady! 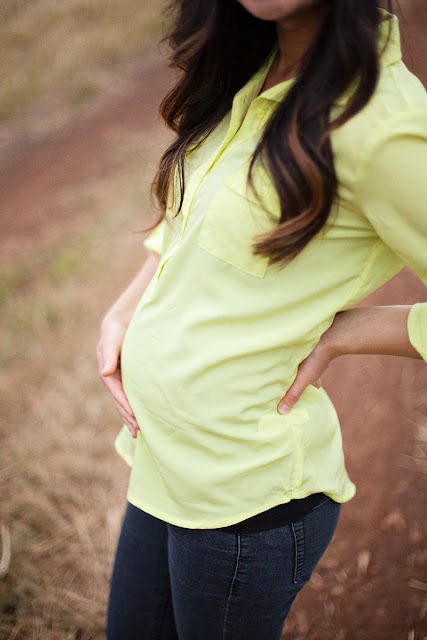 :D when you are as big as me, we'll have to plan another trip so I can take your maternity pics. And PS BOYS are so fun! You'll be such a great mommy!! Hooray! I am so happy for you and Daniel. Yay!! Boys are the bee's knees! I believe in naming children after great people. You two have no shortage of options. <3 you both. Can't wait to see this little prince!